Tower Guard instantly adds a shine to towers, outriggers and other hardware. 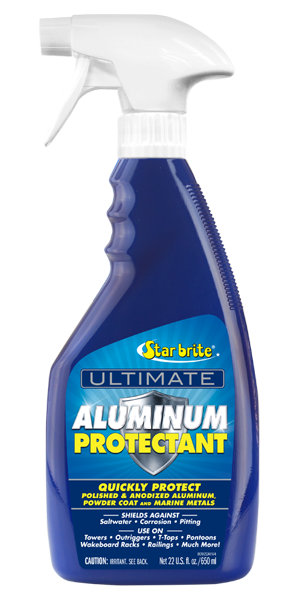 The formula cleans and protects stainless steel, brass, aluminum, chrome, bronze, anodized and other metal surfaces. High-tech polymers create a durable shine as well as a protective coating against UV rays, salt, corrosion, moisture and weathering. Special polymers provide a protective barrier against damaging UV rays, salt, corrosion and dirt. Polymers actually bond to surface for long-lasting protection. Ideal for use on towers, T-tops, railings, wakeboard towers and all other polished metal surfaces. Spray or use a sponge to apply product, then use a cloth to wipe up excess. Spray only on areas to be treated, wiping up overspray immediately to avoid causing slippery surfaces. Apply generously to previously untreated surfaces. Applied regularly, will keep marine metals looking great.